The game's artwork, in which Mario is holding a Punch Ball. 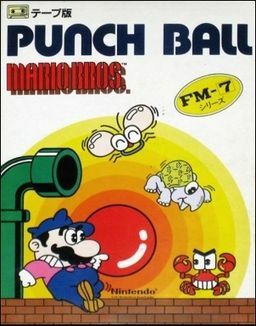 Punch Ball Mario Bros. (パンチボールマリオブラザーズ) is a game created by Hudson Soft in 1984. The game had versions for the PC-6001mkII/NEC PC-6601, PC-8801, FM-7, Sharp X1, Sharp MZ-1500, and IBM-JX,  most of which had noticeable differences between each other (palette, sound, flow of gameplay, etc.). It is very similar to Mario Bros., but with new objects called Punch Balls that could now be thrown to stun enemies. Once stunned, the hit enemy could be hit like normal. The details of the licensing of this game aren't clear, but Punch Ball Mario Bros. is probably one of the earliest licensed Mario games. It is unknown why Hudson Soft was permitted the rights to and chose to make the game. Hudson also produced two other Mario games for Japanese home computers: Mario Bros. Special and Super Mario Bros. Special. Like in the original, Mario and Luigi starred in the game. Common enemies from the original also appeared, such as Shellcreepers and Sidesteppers. Unlike the original, the floor-level design is almost the exact opposite of the original Mario Bros. For instance, the first platform (above the floor) in the original extends from the edges, with a gap in the middle. In this game, the platform is in the middle, with gaps around the edges. Footholds are sturdier and do not trip the enemy if hit from underneath like the first Mario Bros. - either the Punch Ball or the POW Block must be used to achieve this. The button for throwing the Punch Ball is the same as jumping, so Mario and Luigi must remain still to throw the Punch Ball rather than jump. Once thrown, the Punch Ball stays on the ground until collected by one of the plumbers. Since Freezies do not appear, stages that are ice are completely ice. A typical stage from the game. Mario hitting a POW Block in the game. When this happens, the screen inverts its colors momentarily. This page was last edited on December 2, 2018, at 06:24.